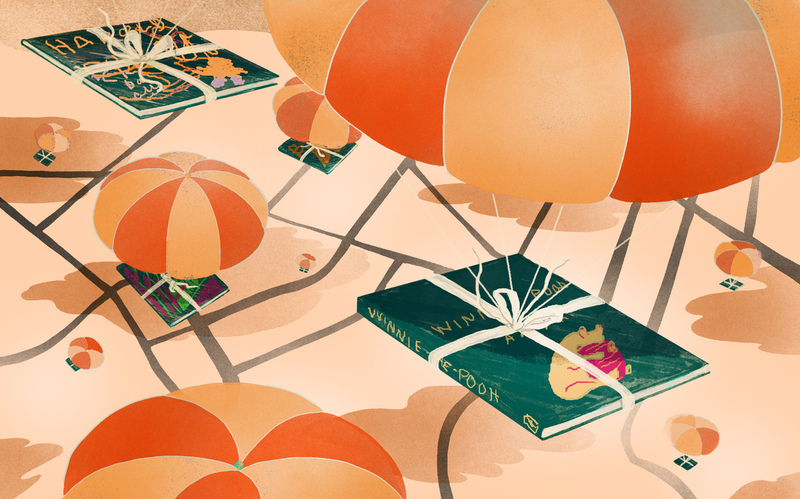 Baby's Got Mail: Free Books Boost Early Literacy : NPR Ed A simple, scalable program founded by Dolly Parton reaches children before they enter school: In participating communities, enrolled kids get a free book in the mail every month until they turn 5. Editor's note on Aug. 9, 2018: Since this story was published, NPR has published a story that re-examines the "30 million word gap" cited below. "A busybody." That's how Raven Judd describes her 10-month-old daughter Bailey. "She loves tummy time. She likes to roll over. She'd dive if you let her," says the 27-year-old mother from Washington, D.C. There is one thing, though, that will get her baby girl to stop what she's doing: when her mother reads her favorite book, the aptly named My Busy Book. "Her eyes get really, really big," Judd says. "She gets excited and will start hitting on (the book). When I start reading out the numbers and alphabet, I turn it into a little tune, and then she starts laughing," Judd says. "A lot of parents think, 'Oh, my child is too young to read,' or, 'He can't read yet,' " says Michael Linder of the D.C. Public Library. "You have those parents who aren't aware of the importance of early literacy." And the research says, it is extremely important. A pivotal study from the early 1990s identified what's become known as "the 30 million word gap" — that is, by age 3, children from families on welfare are exposed to 30 million fewer words than their more affluent peers — and the words they experience are more discouraging and negative compared to their peers' vocabulary. And the disadvantage can last beyond PreK: Testing in the third grade showed "a sustained and measurable difference among the two peer groups." There's even evidence that reading to young children may have an impact on how their brains process stories and may help predict reading success. The program in D.C. operates as a partnership with the Imagination Library, a national nonprofit run by country music singer and actress Dolly Parton's Dollywood Foundation. Local partners like the D.C. Public Library pay $25 per child per year, an amount that covers the cost of the book and shipping. In return, the Imagination Library chooses, sources and ships the books. A panel of early childhood literacy experts selects the age-appropriate books, which are organized around themes and concepts and include two bilingual Spanish-English books per year. The choices range from time-tested titles like The Tale of Peter Rabbit by Beatrix Potter to contemporary classics such as Newbery Medal winner Last Stop on Market Street by Matt de la Pena. Parton first launched the Imagination Library in 1995 in eastern Tennessee, where she grew up in poverty with a father who couldn't read. The program expanded nationally in 2000. Now, there are Imagination Library programs in all but one state and in the United Kingdom, Australia and Canada — reaching more than 1 million children a month in the U.S. Right now, only Tennessee has a universal program — although North Carolina's legislature recently approved funding to start expanding statewide. D.C. mom Martinette Jennifer says her favorite part of the program is that it includes bilingual books for her Spanish- and English-speaking 16-month-old, Dakota. "I can't imagine being 5 years old and having my own little library from the time that I was born up until then," Jennifer says. "It's definitely encouraging Dakota to get excited about books and hopefully that continues as she gets older." The D.C. program launched in February 2016, and nearly 27,000 children are enrolled currently, or 57 percent of all eligible children. The program targets specific areas in the city — based on literacy rates, income and availability of resources — and has enrolled 78 percent of eligible children in those areas. Linder, the program manager and a D.C. native, says he prioritizes getting the word out in communities where residents may not know such resources are available, such as public housing and homeless shelters. For some families, books from the program are the only ones in the home. And having them delivered by mail is particularly special. Interested in signing up for free books for your baby? Check here to see if there is an Imagination Library program near you. "It's their first piece of mail," Linder says. "It's got their name on it. It's completely personalized for the child. That's one of the big things the parents really like about the program." In places like Alaska, Parton's program is getting quality books to remote communities that simply don't have libraries, says Laura Cisneros, director of Alaska Best Beginnings, the local partner for the state's 25 Imagination Library programs serving more than 100 communities. In addition to the rich literacy benefits, some local programs are using the Imagination Library to connect with families of young children on other issues. "When you think about children in that 0 to 5 [years old] space, it's really hard to communicate with that family before they arrive at an institution of some kind," says Jeff Conyers, executive director of the Dollywood Foundation. Cincinnati, for instance, had struggled with the problem of too many children showing up on the first day of school. Many families didn't know they had to register their children in advance; other children weren't immunized properly or were generally unprepared. Now, the city is reaching out to parents of 4-year-olds in the Imagination Library program. Along with their books, they receive reminders about registration and health requirements — and how to take care of it all. Preliminary, unofficial results are promising, Conyers says. "So there's a whole other layer of impact that extends above and beyond building a home library for a child," he says. "It's a regular touchpoint into the home, and it starts to get this literacy process in place and provides an opportunity to communicate with that family on all these other ranges of services." In D.C., for instance, parents enrolled in Books From Birth are introduced to ReadyRosie, an educational website and app that provides parents with ideas for specific activities to help their kids learn. With more and more emphasis on reaching kids before they enter school — and giving parents tools for promoting early literacy at home — the role for programs like the Imagination Library is evidenced by the growth, says Conyers. "We're mailing books (to) over a million children a month in the U.S. alone, and growing by leaps and bounds." Nationwide, the program grew by 12 to 13 percent last year and is projected to expand by another 13 to 14 percent this year. The program's strength, he says, lies in its simplicity. "Parents can understand it, communities can understand it, it's low cost, scalable and the impacts are clearly demonstrated," Conyers says.